Integrated in-service test solution combining a PMD analyzer, an In-band OSA and a high resolution OSA to qualify and troubleshoot high speed DWDM and ROADM networks. PMD of a fiber is measured with traditional methods by injecting a dedicated test signal into one end of the link and analyzing the resulting polarization transformation at the other end. This can only be performed when the network is down. VIAVI's non-intrusive technique used in I-PMD enables to measure PMD in a link that is in-service by using the transmission DWDM channels. 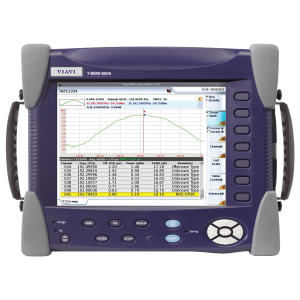 VIAVI unique I-PMD test solution allows troubleshooting faulty channels of 10G / 40G transmission systems and qualifying fiber networks for future upgrade plans up to 100G without turning the entire network down.